A burst pipe is one of the most common plumbing problems people experience. Water damage to your home or office can cause thousands of dollars of destruction in a very short amount of time. Our experienced plumbers have seen it all and will ensure your burst pipe is fixed properly. There’s nothing worse than arriving home to find your carpet flooded due to a burst pipe, and unfortunately, it’s quite a common occurrence. In this day and age when people are installing more complex plumbing systems in their homes, burst pipes can happen all too easily. It isn’t just about the cost of calling out a plumber to fix the repair; instead, it’s about the sheer amount of damage a burst pipe can cause. For this reason, you need a professional plumbing service who can fix the problem fast. Brisbane Plumbing and Drainage's highly skilled and fully licensed plumbers are experienced in emergency burst pipe repairs and/or pipe replacement. All our vans are fully stocked so we can fix the vast majority of problems in a single visit. Whatever time of the day or night simply call Brisbane Plumbing and Drainage and we’ll be there. The most common cause of burst pipework in the home is brittleness. This could be due to extremes of temperature causing the pipe to expand and contract over many years. The second cause is simply old age. Pipes normally burst at their weakest points (usually at the joint) and as the vast majority of pipework is hidden under the floor or above the ceiling, it could be some time before it’s noticed. If you see wet marks in the ceiling or in your backyard, it’s best to call us in straight away. 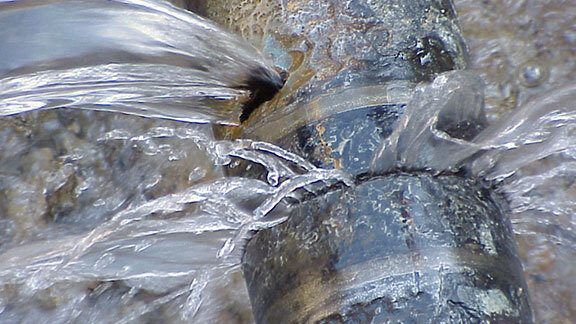 Our leak detection professionals may help prevent any serious damage from occurring. What should you do if you discover a burst pipe? The first thing to do in these situations should always be to cut off the water supply to the house or property by turning off the stop valve. If you can’t find it we can help you find it over the phone. The good news is that when you contact us, you’ll be speaking directly to a fully qualified plumber who will advise you of what to do before we arrive. You also need to make sure there are no electrical appliances in range of the leaking water. If there is you may need to switch off the electrical mains also. Be sure to take photos of any damage for insurance purposes, it’ll make your claim process much easier. Whether it’s the middle of the night, the weekend, or a public holiday you can rely on Brisbane Plumbing and Drainage for your residential, commercial, or industrial burst pipe repairs in Brisbane. Don’t delay, call us on 1300 740 206 now.